1 in 3 Australians are driving with illegal tyres. 89% of Australian Drivers do not know the minimum legal tread depth for their tyres. Tyres at the legal minimum of 1.6mm will take an additional 13.6m to stop from 80kph than a new tyre (3 times the length of a Toyota Corolla). These stats are through lack of consumer information. Mobile Tyre Shop is now able to provide 3D laser tyre reports direct to the customers mobile phone or connected device. Once diagnosed Mobile Tyre Shop will come to you and replace your tyres at home, work or just about anywhere. When was the last time you checked your tyre tread? When was the last time you checked your tyre tread? For most of us the first time we know we need new tyres is when we are told by the mechanic when we are having the car serviced? Do we really, or is it a slow day at the mechanics? While most tyre stores are reasonably trustworthy as a consumer, how do you really know when to replace our tyres? Mobile Tyre Shop has taken the guesswork out of inspecting tyres. Using a hand held laser scanner Mobile Tyre Shop can immediately provide an accurate tread depth reading and can reveal badly worn or unevenly worn tyres symptomatic of problems such as wheel misalignment or worn suspension. 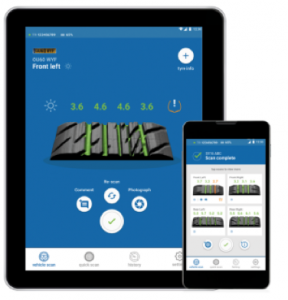 Colour coded 3D scans enable tyre replacement at the optimal time to maximise tyre safety. These reports can be sent directly to the customer’s mobile phone or connected device. The legal minimum tread depth in Australia is 1.6mm however most tyre manufacturers recommend to replace tyres when they reach 3.0mm. Why 3.0mm ? The cynic in you says because tyre dealers can sell more tyres the truth lies in safety. Once a tyre reaches 3.0mm the braking performance of a tyre reduces rapidly. Not only can Mobile Tyre Shop provide you with an accurate report on your tyre safety though once the need for new tyres has been diagnosed we come to you and replace your tyres at your home or work 7 days. Doesn’t a mobile service cost more? No. As the rent and overheads of running a bricks and mortar tyre store increases Mobile Tyre Shop has worked closely on it’s logistics model that enables us to not have to hold stock. All stock is delivered same day from our trusted suppliers. This also enables us not to sell the customer whatever limited stock we have on the shelf but to provide the customer the best tyre for the way the drive their car and at their preferred price point. Most often tyres can be replaced on the same day. So if you have a Fleet of cars or just want a free tyre safety inspection Mobile Tyre Shop are providing free inspections at locations across Melbourne. For location details please call us on 1300 687 000 or email us at [email protected] to find out locations. Mobile Tyre Shop launched in 2012 providing mobile tyre services to B2C and B2B customers across the Melbourne. We supply and fit all major brands with the convenience of us coming to you at home, work or just about anywhere 7 days per week. Mobile Tyre Shop are recipients of the 3AW Momentum Energy Award for Small Business and members of the Australian Fleet Managers Association. Mobile Tyre Shop will launch in Sydney and Brisbane in late 2017.